For many years, the settlement in Maglemosen near Mullerup on West Zealand was considered the oldest known settlement in Northern Europe. The Maglemose Culture from 9000-6400 BC took its name from this settlement. It stood on an islet in a lake where the inhabitants fished for pike with spears and hooks. They collected hazelnuts from the surrounding forests and hunted for various animals including aurochs, bears, squirrels and white-tailed eagles. Today, the site is open to the public via a gravel track across from Toelstangsvej 28. Some of the Maglemosen finds are on display at Kalundborg Museum. When little Anna's dad turned up the crochet hooks" "
One spring day in 1900, little Anna went to school in Mullerup with two carefully sharpened pieces of bone. They had little hooks near the tips and were as brown as the peat where her father had found them. Could they be crochet hooks? The teacher took the schoolchildren to the place where they were found and he realised immediately that it was a Stone Age settlement. Archaeological excavations have since determined that it was a couple of thousand years older than the Stone Age kitchen middens - or compost heaps – that had been the oldest trace of settlements in Northern Europe until then. 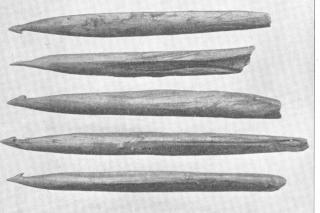 Several more tools like the ones Anna had taken to school were found at the site. They had one or more small barbs and turned out to be the tips of fishing spears.